Carlini CPA, PLLC recently became a Dave Ramsey ELP in the North Charlotte Metro region. Dave Ramsey is a trusted voice in America concerning money and business matters. He is a personal money-management expert, radio personality, and has authored four New York Times best-selling books. Visit http://www.daveramsey.com to learn more. Throughout the country, Dave has a network of professionals called Endorsed Local Providers (ELP) that he refers his listeners to. Carlini CPA, PLLC recently became a Dave Ramsey ELP in the North Charlotte Metro region. Being an ELP is a natural fit for Carlini CPA, PLLC. With over 40 years of combined experience in the field of accounting, Jeff Carlini, CPA and Christine Carlini, CPA take pride in teaching not only clients within their firm on business and tax fundamentals, but truly have the heart of a teacher as evidenced through her QuickBooks classes and his CPA Review classes. Jeff and Christine also have experience teaching the Financial Peace University class at their neighborhood church. Carlini CPA, PLLC is a full service CPA firm located in the Charlotte, NC region that provides Audit, Bookkeeping, Tax, QuickBooks, and Business Consulting Services. The firm now prides itself in being a Dave Ramsey ELP (Endorsed Local Provider). 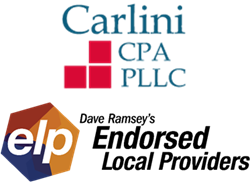 Carlini CPA, PLLC states, “We value our clients immensely, take a personal interest in understanding their business, and celebrate their successes”. Visit the firm’s website at http://www.carlinicpa.com.